UWC Thailand was founded in 2008 as Phuket International Academy and joined the UWC movement in August 2016. It is a day school with boarding facilities and offers a holistic educational program with a special focus on mindfulness. Mindfulness - UWC Thailand integrates Social Emotional Learning and Mindfulness into its curriculum, providing each of its community members support in developing key life skills, including self-awareness and management, social awareness and effectiveness, and approaching work in an ethical and effective manner. Marine Environment Conservation - Situated at the foothills of a national park and 10 minutes from the ocean, UWC Thailand is developing a number of island-wide initiatives that aim to conserve the marine environment (mangrove habitat restoration and coral reef monitoring) and encourage sustainable practices (Plastic Free Phuket, community beach and soil clean ups). Experiential Learning - UWC Thailand has a deep commitment to experiential learning, and to making learning engaging and meaningful for all. Students are frequently out on expeditions, day trips and service-led experiences both locally on the island and regionally throughout Thailand - and beyond. Within UWC Thailand’s environment of authentic and targeted differentiation, equal emphasis is placed upon mental and emotional balance, and academic rigour. Students learn how to learn, analyse, think creatively and reach thoughtful conclusions, making it a demanding program that encourages students to the highest levels of academic achievement. The Nursery program is for students aged 18 months - 3 years old. The Primary Years Program is for students aged 3-12, and the Middle Years Program is for students aged 11-16. To 16-19 year-olds, UWC Thailand offers the International Baccalaureate Diploma Program (IBDP) curriculum. Alongside standard courses, the School offers Thai, Russian, Mandarin, Korean, Dutch, Business Management, Psychology, Systems Design, Global Politics and Arts. UWC Thailand offers a comprehensive activities program for students of all ages. The activities enable students to explore projects and passions in Service, Creativity, Sports, Social and Culture, and are run during lunchtimes, after school and on weekends. In addition, students embark upon expeditions with their classmates, which focus on adventurous training and push the boundaries of their experiences. The expeditions range from Grade 1 students spending a night in the library, which for some is their first night away from home, to Grade 5 students spending 5 days camping and kayaking around the coast of Phuket. Some grade levels take trips to learn how to sail with their classmates, others work with a regional turtle sanctuary to help protect endangered species. Each grade level focuses on a different expedition each year, with each trip being appropriate for the age it caters for. IBDP students organise their own Project Week, which has a central focus on Service and Community. 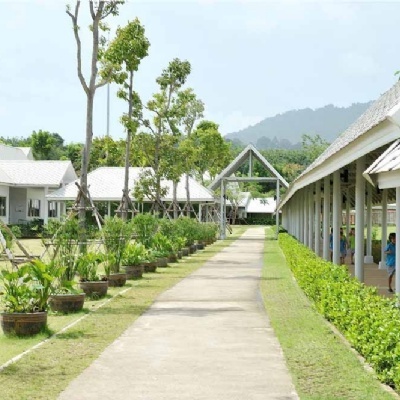 UWC Thailand’s campus is spacious and extensive, and each section is split up into ‘pods’ (Early Childhood, Lower Primary, Upper Primary and Secondary). The boarding house is home to 60 students from grades 7-12, and another is currently being constructed and due to open in January 2018. The school is situated next door to a sports and lifestyle centre, and all community members have access to its excellent sports facilities which include an Olympic sized swimming pool, 500m running track, rugby pitch, tennis courts, volleyball courts and cardio centre. UWC Thailand is situated in the northern part of the island of Phuket. It is a 20-minute drive to the Sarasin Bridge, which connects Phuket to mainland Thailand. North Phuket’s landscape is a mixture of protected national park, beaches and coastal areas, and rubber plantations with local communities.